Emphysema is defined as permanent enlargement of alveolar air spaces with loss of alveolar wall connectivity. This definition does not reflect the true complexity of histological phenotypes seen. In particular, septal thickening and matrix deposition have been recognised in alveolar septae. Changes in microvascular density also occur in alveolar septae and we therefore hypothesised that alteration in the phenotype of septal remodelling may be related to the loss of alveolar microvascularity. Methods: Lung tissue resections were obtained from patients undergoing lung transplantation for emphysema (n = 9) and compared with archival “normal” tissue obtained from lung cancer resections. All material was examined using haematoxylin and eosin stained sections to establish variations in lesion phenotypes. Mesenchymal cell distribution, matrix deposition and microvascularity were assessed by α-SMA, collagen I and CD31 immunohistochemistry, respectively. All emphysema lung material presented with wide heterogeneity in lesion phenotypes and so all of the section was examined. Results: All emphysema sections presented with classic (distended, thin, disconnected) alveolar septae with focal areas of mesenchymal cell and matrix deposition. Thickened septae were also a very common feature in the emphysema group and more marked than in control samples. Two phenotypes were seen: acellular thickening, occupying the whole of the septal unit and a “reticular” pattern of mesenchymal cells and matrix occupying the external facets of the septal wall. Within these thickened zones there was loss of the normal anatomy of the microvasculature, with CD31 immunoreactivity seen as granular deposits within the expanded collagen zones or focal regions abutting the septal margins. Conclusions: We suggest that the focal areas of mesenchymal cell and collagen deposition associated with thin septae may reflect a dysfunctional attempt at repair, possibly reflecting shear-stress responses consequent upon changes in lung biomechanics. By contrast, the thickened septae showed an amplified mesenchymal and collagen response. This may reflect a continuum with the focal reactions, a development that may be amplified by the loss of microvascularity. These observations suggest that the loss of microvascularity may be associated with a change in the repair phenotype and may thus provide insights into the detailed microanatomy of emphysema progression. Alpha-1 antitrypsin (AT) is a major elastase inhibitor within the lung. Oxidation of critical methionine residues in AT generates oxidised AT (Ox-AT), which has a greatly diminished ability to inhibit neutrophil elastase. This process may contribute to the pathogenesis of chronic obstructive pulmonary disease (COPD) by creating a functional deficiency of AT permitting lung destruction. It is increasingly recognised that AT and its conformational forms may play other pro-inflammatory roles. We investigated whether AT conformational forms had any effect on the secretion of IL-8 and MCP-1. We purified native AT from plasma and subsequently prepared preparations of reactive loop cleaved, polymeric and oxidised conformations of AT. Individual conformations of AT were incubated with lung epithelial cells (A549) at 0.03, 0.1, 0.3 mg/ml. Supernatant was assessed for IL-8 and MCP-1 at 4, 10 and 24 h. Oxidised AT significantly induced the production of IL-8 and MCP-1 from A549 cells in a time and dose-dependent manner compared with PBS; p<0.01. In contrast, native, cleaved and polymeric AT had no significant effect on IL-8 and MCP-1 production. Inhibition of nuclear factor kappa B (NF-κB) and JNK reduced secretion of these chemokines significantly; p<0.025. Inhibition of LRP also significantly reduced the secretion of the chemokines; p<0.01. Our in vitro findings were supported by the fact that the instillation of Ox-AT into murine lungs resulted in an increase in JE (mouse MCP-1) and increased macrophage numbers in the bronchoalveolar fluid. Although there was an increase in mouse KC (equivalent of human IL-8) production this was not statistically significant. These findings demonstrate that the oxidation of methionines in AT by oxidants released by cigarette smoke or inflammatory cells not only reduces the anti-elastase lung protection, but also converts AT into a pro-inflammatory stimulus. Oxidised AT stimulates may interact with the LRP receptor and cause the release of MCP-1 and IL-8 via JNK and NF-κB. Oxidised AT generated in the airway interacts directly with epithelial cells to release chemokines. These chemokines attract macrophages and neutrophils into the airways and the release of oxidants by these inflammatory cells could oxidise AT and so perpetuate the cycle. These effects could potentially contribute to the pathogenesis of COPD. Introduction: Blocking the tyrosine kinase receptor HER-2 with the monoclonal antibody trastuzumab has been shown to improve survival in patients with HER-2 positive early and advanced breast cancer. HER-2 receptor overexpression also occurs in non-small-cell lung cancer (NSCLC) and is associated with a poor prognosis: although studies have shown a lack of response to trastuzumab, subset analysis suggests that patients with high protein expression (3+ staining intensity on immunohistochemistry; IHC) or gene amplification may experience a better outcome. However, the frequency of such high receptor expression in patients presenting with early stage lung cancer is unclear. Therefore, we prospectively studied HER-2 protein expression and gene amplification in patients undergoing attempted curative resection for NSCLC. Methods: We studied formalin-fixed paraffin wax embedded lung samples from 104 patients (mean age 70 years (range 46–84), 100 (96%) smokers and 55 (53%) men) with NSCLC (60 (58%) adenocarcinoma, 41 (39%) squamous cell carcinoma, two (2%) bronchioalveolar carcinoma and one (1%) mixed; 35 (34%) stage 1A, 42 (40%) 1B, two (2%) 2A, 16 (15%) 2B and nine (9%) stage 3A). For each patient, four cores of tumour tissue and two cores of normal lung were constructed on a tissue micro array and HER-2 expression was measured by IHC (Dako HercepTest) and gene amplification using fluorescent in-situ hybridisation (FISH; Kreatech Diagnostics HER-2 DNA Probe kit). HER-2 protein expression was scored using the validated Hercep scoring system. FISH results were expressed as the ratio of HER-2 signal to chromosome 17 signal and tumours with a ratio of greater than 2 were considered to be amplified. Results: Of the 104 cases, 99 were HER-2 negative and four showed weak immunostaining (1+ intensity). Borderline HER-2 protein expression was seen in one patient (2+). HER-2 3+ protein expression was not seen and there was no gene amplification. Conclusions: These results show that in patients presenting early with lung malignancy, HER-2 may not be involved in their carcinogenesis and thus trastuzumab is not indicated in their treatment. Further investigation of HER-2 receptor activation and interactions with other epidermal growth factor receptors and downstream signalling pathways is ongoing. Introduction and Objectives: There is a marked survival advantage for patients with non-small-cell lung cancer (NSCLC) who have high numbers of macrophages in their tumour islets. We have previously evaluated the microlocalisation of cytotoxic M1 and non-cytotoxic M2 macrophage phenotypes in NSCLC. This study investigated the non-macrophage expression of markers associated with M1 and M2 macrophages in NSCLC. Methods: Using immunohistochemistry, CD68+ macrophages and markers associated with an M1 phenotype (HLA-DR, inducible nitric oxide synthase (iNOS), myeloid-related protein 8/14 dimerisation (MRP 8/14) and tumour necrosis factor-alpha (TNFα)), or an M2 phenotype (CD163 and vascular endothelial growth factor (VEGF)) were identified using a double-stain technique. Non-macrophage expression of the markers was analysed in the islets and stroma of surgically resected tumours from 20 patients with extended survival (ES; median 92.7 months) and 20 patients with poor survival (PS; median 7.7 months). Results: The density of non-macrophages expressing each marker in the islets of ES and PS patients was 3.9 and 5.2 (CD163, p = 0.39), 2.1 and 11.4 (VEGF, p<0.001), 111.7 and 15.9 (HLA-DR, p<0.001), 19.7 and 9.6 (iNOS, p = 0.02), 6.3 and 2.2 (MRP 8/14, p = 0.02) and 25.8 and 14.6 cells/mm2 (TNFα, p = 0.25), respectively. The non-macrophage density for each marker in the stroma of ES and PS patients was 45.9 and 22.2 (CD163, p = 0.04), 18.6 and 20.1 (VEGF, p = 0.25), 22.6 and 66.6 (HLA-DR, p = 0.16), 6.4 and 17.7 (iNOS, p = 0.002), 3.9 and 9.8 (MRP 8/14, p = 0.01) and 10.7 and 22.9 cells/mm2 (TNFα, p = 0.01), respectively. Conclusions: When macrophages were excluded, there was increased expression of markers associated with cellular cytotoxicity and inflammation in the tumour islets of patients with ES compared with PS. Conversely, there was increased expression of pro-tumorigenic VEGF in the islets of patients with PS compared with ES. These results demonstrate that cells other than macrophages express markers associated with M1 and M2 macrophages and that they may make an important contribution to cytotoxic and pro-tumorigenic responses. Background: In the lungs of patients with idiopathic pulmonary fibrosis (IPF), apoptosis is increased in alveolar epithelial cells (AEC) but reduced in fibroblasts. Patients with IPF have a decreased capacity to upregulate cyclooxygenase (COX)-2 and thus fail to induce synthesis of the anti-fibrotic prostanoid prostaglandin E2 (PGE2). We hypothesise that this reduction of PGE2 in IPF modulates the paradox of increased AEC but reduced fibroblast apoptosis. Methods: To assess apoptosis human fibrotic and control lung sections were TUNEL stained and immunostained for active caspase 3 and cleaved PARP. Primary type II AEC and fibroblasts were derived from IPF and control lung sections obtained at surgery. Apoptosis of AEC and fibroblasts was induced with Fas ligand (FasL 50 ng/ml). Cells were also treated with either the non-selective COX-1/2 inhibitor indomethacin (5 μg/ml), the COX-2 inhibitor NS398 (5 μg/ml) or PGE2 (32 ng/ml). Competitive agonists/antagonists of the E-prostanoid receptors were used to determine cell signalling mechanisms. Apoptosis was detected by annexinV/propidium iodide and analysed by flow cytometry. Regulation of proteins in the apoptotic pathway, including Fas, Bcl-2, BAD and XIAP was assessed by quantitative reverse transcription PCR, Western blotting and immunohistochemistry. Wild type (WT) and heterozygous COX-2-deficient mice received oropharyngeal bleomycin (2 mg/kg) or saline and apoptosis at day 14 was assessed by TUNEL. Results: Frequent AEC apoptosis was seen in IPF but not control lung tissue. Fibroblasts from IPF lung (nine lines) were resistant to FasL when compared with control lung fibroblasts (six lines). Control fibroblasts were protected from apoptosis by COX-2 inhibition. PGE2 increased FasL induced apoptosis of fibrotic fibroblasts but reduced apoptosis in patient-derived fibrotic primary type II AEC. Consistent with this TUNEL staining showed increased AEC, but decreased fibroblast, apoptosis in COX-2-deficient mice compared with WT. Expression of EP2 and EP4 receptors is increased in IPF lung compared with control. PGE2, via EP receptor signalling, decreases the expression of the key inhibitor of apoptosis XIAP. Conclusion: Failure to upregulate COX-2 and PGE2 in IPF contributes to aberrant profibrotic changes in fibroblast and epithelial cell apoptosis. PGE2 restores the sensitivity of fibrotic fibroblasts to FasL and does this, at least partly, by downregulating XIAP. Abstract S132 Representative results from one line of fibroblasts (A) and type II airway epithelial cells (B) derived from a patient with IPF. Fibroblasts are resistant to FasL induced apoptosis but are sensitized by the addition of PGE2. 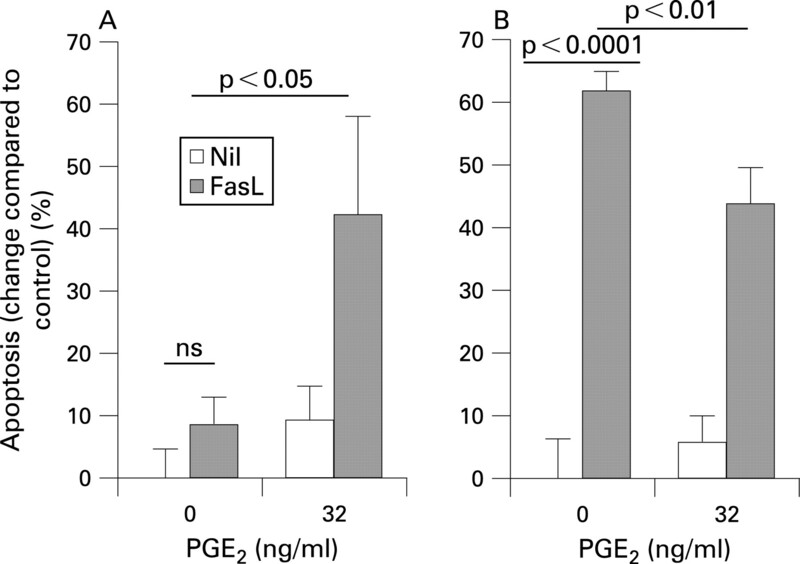 AECs undergo apoptosis in response to FasL but are partially protected by exogenous PGE2.